A movie about plastic surgery gone horribly wrong. In her pursuit of happiness through physical perfection, she never made it off the operating table. A death mask was made in her honor, and in turn was buried with her. Her soul was so plagued by the fear of losing her body, that she rose from her grave still lugging her dead corpse along with her. Her family so ashamed of her selfish disfigurement had made the mask in her likeness .. not of the face she was put to rest with. So she wears her death mask never to remove it, in hopes she will find a cure for her un-beating heart. Ola! I am back with a whole bunch of new wonderfully creepy items to show you today. First off how about this fabulous Undead Perfection set New from Pididdle available at the Cinema. I think she looks so divinely sad with her bleeding tears. This wonderful set has a few different pieces to it, the amazing Undead Perfection Mask and the Bodysuit complimented by the Plastic Surgery Marks and Nails……do not miss these they are entirely needed for the season or whenever you just want to be part of the undead, this is sl after all. 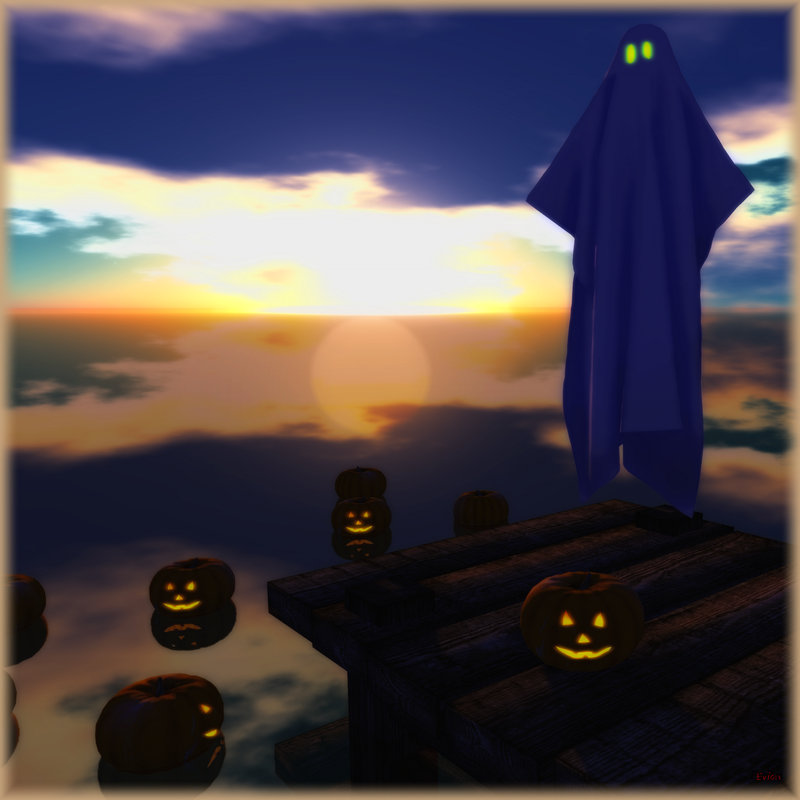 I am surrounded by floating pumpkins, now these floating pumpkins from Hanaya float in prim waters or you can buy the linden water version, or just go with the plain static pumpkin. They emit fog as well as dance in your water, I love these fabulous mesh pumpkins they are all over my tiny little land. Now onto the Spooky Pathfinding Ghosts. They float around and come with a fabulous Spooky Sound and their eyes turn different colors as well, they rez as leaves on the ground and you are just one touch away from having your very own spooky house and land! Posted in AnotherDamnSlBlog and tagged as Amacci, Cinema, Hanaya, Pididdle.